Former tobacco farmers load new produce for market as part of crop-substitution program. In China, 350 million people smoke. Each year, 1 million die from smoking. Many more become disabled. Approximately 20 million Chinese farmers produce the world's largest share of tobacco, nearly 40 percent of the global supply. What is the key to cutting the number of deaths and smoking-related health problems? Convince Chinese farmers to grow some other crop. Virginia Li, a professor of community health sciences at the UCLA Fielding School of Public Health, set out to do just that. She contacted local Chinese agriculture officials in Yunnan Province, where Asia's largest cigarette manufacturer is located. Li and her local partners designed a tobacco crop–substitution project, the core of which is a farmer-led, for-profit enterprise. The farmers, many of whom are not formally educated, were able to acquire the knowledge and skills necessary to substitute food crops, including fruits and vegetables, for tobacco. 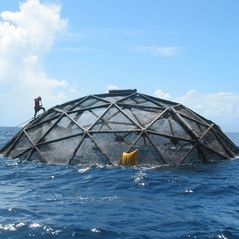 By doing that, their annual income increased between 21 percent and 110 percent per acre of land, and the amount of tobacco being grown was reduced. A report on the project appears in the current online edition of the American Journal of Public Health. In 2003, the World Health Organization highlighted the need to provide "support for economically viable alternative" activities for tobacco workers, growers and sellers. China was among the 192 WHO member nations that signed the organization's landmark international treaty, declaring its commitment to tobacco control. It was a milestone choice for a country in which approximately 20 million households and 100 million people depend on tobacco cultivation, manufacturing and sales for their livelihood. Asia's biggest cigarette manufacturer, the Hongta Group, is located in southwest China's Yunnan Province, in a tobacco-growing municipality called Yuxi. Yunnan is famous for its tobacco, and the province's choicest farmland is committed to the plant. 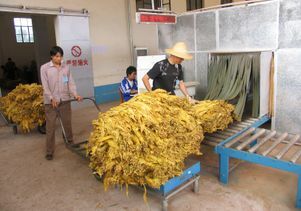 Tobacco production has elevated Yuxi's economy to first in the province, where more than 600 million mu of farmland produce tobacco (one mu equals about one-fourth of a Western acre). The average Chinese farmer owns about one mu of land, and a family may own three to seven mu. Tobacco farming and promotion are the twin forces driving the demand for tobacco, Li said. "For China to reduce tobacco use, public anti-smoking campaigns are not sufficient," she said. "The key is to show that income from crop substitutions can exceed that from tobacco growth. That's essential to persuading farm families to stop planting tobacco, which is their livelihood." 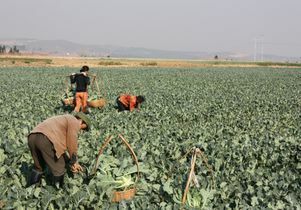 So in Yuxi municipality, Li and her collaborators from the Yuxi Bureau of Agriculture designed and initiated a tobacco crop–substitution project. The agriculture bureau worked with village heads to recruit farm families through announcements at village meetings and word of mouth. At three sites, 458 farm families volunteered to participate in a new for-profit cooperative model. Assisted by the local bureau, farmers organized cooperatives through which they acquired the necessary skills for accounting, producing the highest possible crop yield, conducting market research, and storing and selling their produce. They elected their own officers, and participating farmers wrote the charter and bylaws. Each cooperative's responsibilities to its members included supplying seeds, pesticides and needed materials at the lowest possible cost through bulk purchasing. Local agricultural specialists provided farmers with training and technical-support workshops in classrooms and in the fields. Core training focused on identifying market channels for selling their produce, seed selection, the use of less toxic pesticides to grow "green" food, warehouse storage, distribution, sales and accounting. The cooperatives enabled the farmers to create a system for transferring and depositing harvests in warehouses for distribution and sale. Farmers collaborated to identify suitable food crops to match the local soil quality, climate and water availability. For example, the Hongta District cultivated grapes and white mushrooms — mushrooms in particular require little water and land. Chengjiang planted popular but non-indigenous gherkins, cauliflower, broccoli and peas. Eshan County, which has dams, planted moisture-loving arrowroot in wet fields. The project successfully demonstrated an approach that engaged farmers in cooperatives to substitute food crops for tobacco, thereby increasing the farmers' annual income between 21 percent and 110 percent per acre, Li said. "This was a remarkable accomplishment," she said. "The Yuxi pilot demonstrated that farmers, many of whom do not read or write, are able to learn the knowledge and skills necessary to operate an enterprise that gives them an income superior to tobacco farming." Widespread crop substitution based on this experiment, she said, will yield multiple benefits for China, including enhanced food security and an improved environment. Although China is a latecomer to tobacco control, an alliance between public health and agriculture can create a new era in tobacco control, improving the quality of life for all. The new farmers' cooperative model may be reproducible across China's vast and diverse terrain, Li noted, because local agricultural bureaus can provide the necessary training to farmers in their areas. Support for the project was provided by the Hung and Jill Cheng Charitable Fund. The UCLA School of Public Health is dedicated to enhancing the public's health by conducting innovative research; training future leaders and health professionals; translating research into policy and practice; and serving local, national and international communities. 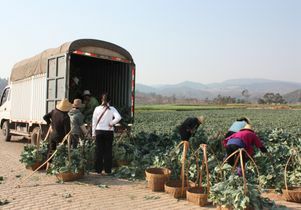 Former tobacco farmers load new produce for market as part of new Chinese crop-substitution program.